Drakenvale looks suspiciously like a dragon mountain (and not a valley) to me. Perhaps the valley refers to the forested expanse around the mountain. Regardless, the whole dragon saving plot feels like it’s been done before…at North Mountain. The basic premise is the same, climb the mountain find the dragon grass and feed it to the ailing dragon. Before you climb too high up the mountain there are a few nuances to bear in mind. Many of the residents of this mountain are dead. If you failed to gain the Requiem Song from Quelb do not proceed. It is one of the most painless methods to dispatch undead and will come in quite handy in a battle near the summit. I know bards are pansy harp-toting wusses and you don’t want them in your party. Bite the bullet and make one—just for this mountain. The Drippy carry a Sage’s Surplice as a rare steal. Snag your ill-outfitted crooner some clothes. Drippy’s normal steal item is a Mythril Hammer. Your only opportunity to obtain this axe was back at Karnak. So if you didn’t get one, or you want another, steal away. In addition to stealing fun items from Drippy, he also casts the blue magic spell Magic Hammer. The Poison Eagle also carries a useful weapon. You can steal the Hayate Bow (not sold in stores) from him. Hitting him is another matter. The eagle has a 50% evade rate. He only has 100 hp. When you give up trying to hit him, cast 1000 Needles on him and call it a day. Or utilize the hunter’s Aim ability. Lycaons are rather unremarkable cat creatures. They appear on the slopes of the mountain and don’t carry anything noteworthy. They do hit rather hard though and arrive in groups of up to five. With the exception of the hit and run Golem (????) the rest of the area enemies are undead. They all have too many hp for their own good. Zombie Dragons have 4,590 hp and Bone Dragons, found deeper in the caves, have 2,590. Zombie Dragons cast Poison Breath on the entire party. It can inflict about 400 points of damage and almost certainly poisons three or four party members. You may wish to linger fighting the Zombie Dragons hoping to steal Dark Matter from them. If you can, confuse them first so you don’t have to worry about that devastating spell. Since Dark Matter is a rare steal it takes a bit of finagling to score one. I had three thieves in my group and still had trouble obtaining any. But they are great items if you use the chemist’s ! Mix ability. The Bone Dragons only carry Gold Needles. Their Bone attack reduces hp to single digit, so best be wary when fighting them. Perhaps I exaggerated a bit when I said not to continue if you didn’t have Requiem. The incredibly powerful song inflicts 1,800-2,000 points of damage against undead. Requiem is obviously not the only method of dispatching the gruesome foes. The standard methods, casting Cura, Raise or utilizing any number of healing items, work just as effectively. But isn’t it fun to know that your poor little bard sings so badly it actually puts the undead to rest? I think the first chest you find is a bribe to keep your interest high despite the rehashed storyline. Duck into the first cave and pluck 5,000 Gil from the chest. Exit exuberantly and hike on up the mountain. The beginning of the dungeon consists of hiking up the ziggurat lickety-split. There are no diversions, so enjoy the view and press on. You’ll come to your second treasure, a Cottage in the third cave. You will have occasion to use it later in the dungeon. Exit to the glaring sunlight and cross the rickety rope bridge. Don’t look down. Run through the next creepy crawly infested cave. You exit the cave to an expanse littered with animal bones (presumably dead dragons or their food…). Tossed in among these bones is one of the strongest armors in the game: The Bone Mail. It has a minor drawback—it turns its wearer undead. But, it absorbs poison, so they can be healed by it. Still, I’d pick up the armor. Just keep in mind when you change classes that it will often equip automatically. Walk downward toward the next cave entrance. Stop at the last outcropping of bones. Search the second bones from the bottom to recover the Bone Mail. 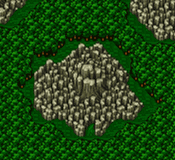 It’s also at this stretch of mountain that you may see your hit and run Golem friend again. You’ve most likely seen him a time or two on your trek up the mountain. Until now he’s appeared alone, hit once and fled. If you encounter the Golem along with a Zombie Dragon and a Bone Dragon, don’t attack the Golem. When the battle starts all of the enemies will be facing your party, but soon after both undead dragons face away from you and attack the Golem. The Golem will begin pleading for your help. It behooves you to save him since you’ll gain him as a summoned monster after the battle. If you do accidentally kill the Golem just wander around. He’ll reappear with the dragons again. Though these dragons look like the ones you’ve been fighting in caves, they’re not the same monsters. The Zombie Dragon actually has less hp than his “normal” incarnation, and the BoneDragon has more. The biggest distinction is that these dragons are not susceptible to the nefarious death by PhoenixDown or Life spell. You’ve been saving your buff bard for this battle. A couple blasts of the Requiem song and the dragons will be deader than a Saturday night in Salt Lake City. If you didn’t prepare, or are boycotting the bard, you have a couple of options. Both dragons are weak to fire spells. Unfortunately you have to kill them singly to avoid offing the rock monster. That rules out throwing a fire tech with your ninja. Pick your favorite fire attack. They all do around 1,000-1,600. Don’t bother trying to cast Cura on them. It doesn’t even manage to inflict 490 points of damage. And if you try and be tricky by casting Regen on them—in effect poisoning them—don’t bother. Regen actually heals them. After you’ve defeated the dragons there will be a short pause and then the Golem will thank you and ask to join him. Never refuse aid. You receive the Golem as an item just like you did Ramuh. Go to the item screen and use the Golem. The next section of the caves can be tricky. The lower cave is unreachable, and the cave at hand appears to be a dead end. In order to progress you need, like Alice, to fall down the rabbit hole. Wander around the right side of the cave until you crash through the floor. There is nothing like a treasure chest to take your mind off of a bad fall. Open it to increase your hush money by 7,000 Gil. Go through the bottom door. You arrive in front of a mysterious switch. Pull it and watch the landscape of the mountain change creating a path to the elusive southern cave. Go back whence you came and take the northern door back to the main part of the cavern. Take the left path first to reach to treasure chests containing rare goodies. The chest on the left contains a Hypno Crown. The Hypno Crown is for use with whichever character you use to control monsters since it increases the success rate of the ! Control ability. It has an added bonus of increasing mpwr by 1 and has a decent def of 5. The chest on the right harbors a Wind Slash. This is only the second katana you’ve come across, and its power isn’t that great, though it does inflict wind-elemental damage. It’s still better than the plain old Ashura your samurai has been stuck with. When you’re finished ogling your new treasure, backtrack and continue down the right path. At the end of the darkened path a treasure chest lights the way. This final chest contains a Phoenix Down, which may or may not come in handy. Exiting the first door directly south takes you to a much needed save point. Use a Tent or Cabin and save before continuing. You’re almost to the summit. Exit the western door to the last stretch of mountain. You may want to prepare for the ensuing fight before continuing. Once the hiryuu grass is in sight you are drawn to it and can’t switch your jobs around. Unlike most unique bosses, the Dragon Pod does not attack your party. That doesn’t mean nothing happens during the battle, or that it will be easy. Five baby Dragon Flowers surround the Dragon Pod. Each of them casts a different debilitating status effect. From left to right the flowers attack using Confuse Powder, Paralyze Powder, Darkness Powder that blinds, Silver Powder that ages, and Poison Powder. Each of these does a paltry 100 points of damage, but the status effects are the real worry. The obvious answer is to employ a couple white mages with the heal ability. The subtler and more effective method of attack requires a summoner. Summon Golem. His Earth Wall shields your entire party from damage and status effects allowing you to focus on killing the plants. You can take out all of the flowers with a magical flick of your wrist, but the Dragon Pod resurrects them immediately. Concentrate on the Dragon Pod rather than his inconsequential flowers. The plant has no immediate weaknesses, but he is susceptible to Death Claw, which makes short work of his 12,000 hp. If that’s not an option, throwing money with ! Zeninage works extremely well. You can also Gravity the plant into oblivion. The Lamia’s Harp hits the Dragon Pod for about 2,000 points of damage. If you still have your little bard with you, Requiem won’t work, but whapping the enemy upside the head with a harp will. Don’t bother with black magic. The plant and flowers are immune to their elemental spells. The summoner’s elemental cast (Ifrit, Ramuh, and Shiva) cause miniscule damage. Titan’s Gaia’s Wrath musters a tidy 1,500 points of damage however. After you beat him using your favorite method, you will receive 10 abp an Elixir and perhaps a couple Phoenix Downs. Now you have to get out of the mountain and bring the Dragon Grass back to the Castle of Bal. At this stage in the dungeon the trek down feels long and arduous. Fortunately it’s also unnecessary. Have a time mage cast Teleport.The party teleports to the foot of the mountain, saving much time. You must still march back to Bal Castle and find the dragon, but now you can get rid of the bard since there are no undead along the way. You may remember instructing your guards not to let anyone into or out of the castle after your departure. They took the king’s words to heart and believe even him to be a servant of the enemy. Fortunately Galuf knows alternate entrances to the castle. It shouldn’t be surprising that you enter using the switch in the moat. Your first order of business once you dry off is to head up towards the dragon’s roost. Stop by Krile’s room first. She tells you of a sage named Ghido who has been calling her. Your next destination is Ghido’s Cave, which is a tiny island off the northeast coast of the continent. You need the wind drake in order to reach the cave. That’s why you went through so much trouble to retrieve the Dragon Grass. Go upstairs and force-feed the wind drake his curative. Now you can continue your journey on to the cave. This dragon has the same limitations as your previous mount, so there’s really only one place you can go. Fly northeast and leave the continent at the only break in the rocky mountains. Don't forget that once you're in the castle moat, there's a Great Sword hidden in the water! Go up and around the eastern side of the castle, and it's at the very end in a corner. Heres one put Barefist on and beat it to death. maybe Golem resents Ex-Death too but he may not realize at first that the travelling band are the Four Warriors of Light. he realizes his worth when you saved him from the Bone Dragon and the zombie Dragon so don't whittle down Golem's HP though. So be patient when he hits you at first when he is alone. Just wait until he is with the two undead type dragons. The Blue magic "missile" works on the Dragon Pod. So you can take it down to 1/4 health in one hit. i had Galuf as the summoner class. to defeat the little dragon flowers. use Titan once and he will smash them into pieces. then have Faris as the ninja and throw several shurikens to the Dragon pod. don't use the Zeninage (it will be a shortage of money in the future for your party to buy new and more expensive weapons and spells). then of course, i didn't forgot to set Lenna into the dancer class (just make sure she will perform the sword dance every now and then) w/ a white magic. I set Bartz into a hunter class and used the aim (not the rapid fire this time) because Faris will deal for the rest. just aim at the dragon pod, not the dragon flowers. For Golem one of the best ways I can think of (but haven't actually tried) is four black mages with !Mix (from Chemist). To do this simply Mix an Eye Drop with an Ether to make Resist Fire, then give it to Golem and continue the battle spam-casting Fira (Fire2). The battle will pretty much be yours. If you think Golem is taking to much damage then mix a Potion or a Turtle Shell with an Ether and give that to Golem to completely heal him. Another good strategy for the flower battle is to have a party of either Elementalists with Jikuu or Time Mages with Terrain, it's your call. First round cast Fast2 followed by a constant wave of Terrain castings. The most common attacks will be Cave-In and Earthwuake, the later easily wipes out all the mini-flowers while Cave-In crushes the Hiryuuplant. An easy way to defeat both the flower and the dragons is to have a monk or samurie with "!Sing" ability useing charm song, requiem, and regen song as well as a balck mage with the highest form of fire you can have, a white mage likewise with cure, and either a summoner or a M.Knight with control or learning.